Broomrape (Orobanche cumana) is a parasitic weed that causes substantial yield losses in sunflower. 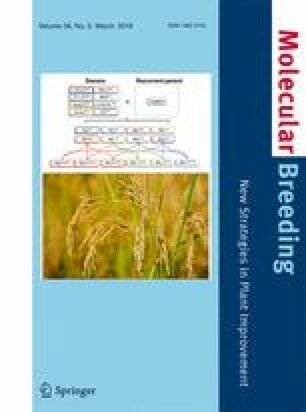 In this study, four biparental genetic populations comprised of between 96 and 150 F3 families were phenotyped for resistance to broomrape race G. Bulk segregant analyses (BSA) combined with genotyping-by-sequencing (GBS) technology was used to verify previously identified genes and map new resistance QTLs. Resistance had a polygenic basis, and numerous QTLs were found in all mapping populations. Contributing components to resistance that were common to all populations mapped to two major QTLs on chromosome 3, which were designated or3.1 and or3.2. QTL or3.1 was positioned in a genomic region where a previous broomrape resistance gene Or5 has been mapped, while QTL or3.2 was identified for the first time in the lower region of the same chromosome. Following the identification of major QTLs for resistance using the BSA-seq approach, all plants from three F2 populations were genotyped using newly developed CAPS markers nearest to the QTL peak for or3.2, which confirmed the association of these markers with broomrape race G resistance. The results of this study will bring us a step closer to understanding the mechanisms underlying resistance of sunflower to highly virulent broomrape races, and the molecular markers developed herein will be highly useful for sunflower breeding programs. The online version of this article ( https://doi.org/10.1007/s11032-019-0948-9) contains supplementary material, which is available to authorized users. This work was in part supported by project TR31025 financed by the Ministry of Education, Science and Development, Republic of Serbia and funding from Genome BC and Genome Canada to LHR.